Six of Chavismo’s candidates for State governorships in the the 16-D regional elections have something in common beside being chosen via “neurological primary”: they are not residents of the states where they were sent to run. In fact, they couldn’t vote for themselves in December as the electoral register will be the same one used on the presidential election, which took place earlier this month. What’s that you say? Those same candidates can NOW vote in their new states. Voilà! Matter of fact, 108 special reallocations were made to the REP outside of the established legal period. Socorro Hernandez, one of the five CNE heads (and former Chavernment Minister) justified this situation as “an extraordinary case that doesn’t make any impact”. Her attempts to dismiss all criticism makes this recent Capybara article almost prophetic. But this particular trick wasn’t familiar for fellow CNE board member Vicente Diaz. The MUD is demanding those changes are reverted but that looks unlikely. 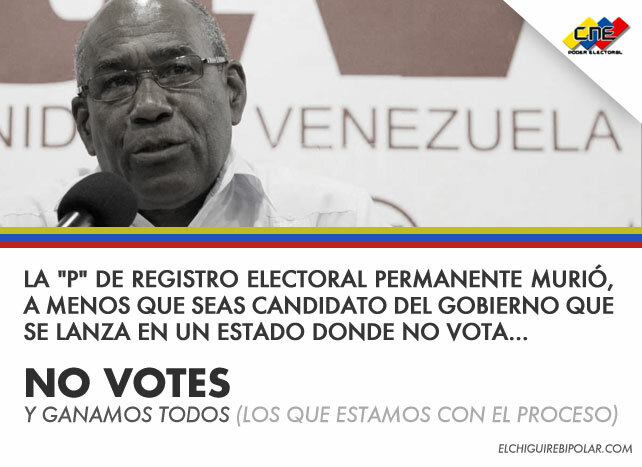 After all, PSUV candidates (and their buddies) have more rights than the rest of Venezuelan commoners. Previous articleIs Venezuela a democracy?